New Delhi: Union Minister of Human Resource Development Shri Prakash Javadekar today inaugurated the one day National Consultation on Revised Accreditation Framework here in New Delhi. Highlighting the importance of quality education the Minster said any accreditation process or any certification or assessment process must also take into account the final product of it. Subject knowledge is one thing, the delivery of subject knowledge, infrastructure and building skill component in a student are another part. 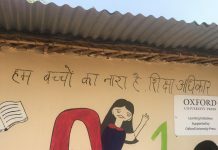 But ultimately the aim of education should be to build a good human being and only that kind of education could be termed creative that is capable of doing so and hence it should also be checked whether the parameters of intention, policy and schemes are getting reflected in the very institution, he said. Shri Javadekar appreciated the observations of MoS Dr. Mahendra Nath Pandey in this connection and emphasised to think of education in totality and said it must reflect in the ranking of institutions He said quality of education imparted by any institution will be reflected in its adaptability to change. The Minister referred to the recent advertisements of institutions citing its NAAC ranking, its certifications and assessment reports and on its basis the trend of students in selecting institutes for further education. He said now the institutes have also added up NIRF ranking as a feather in their caps. The Minister said now the students as well as the society can’t be misguided any more as the pressure of quality is now working. He said there is no substitute for quality and it must be sharpened regularly. Shri Javadekar said our government exists not merely on the majority mandate we have got, rather we are here to reform, transform and perform. He said complete transformation of education is a dire need now. He advised NAAC authorities to expand its team in order to make inroads into reaching out more and more institutions. He also stressed upon the cross checking of data collected and ensure sanctity and authenticity of Data Base created in this area. The Minister said the system created for this purpose must be transparent with clear cut rules and regulations and there should be no scope for fraudulent means. He hoped that today’s deliberations will pave way for a new transparent accreditation system. Shri Javadekar also pressed for using Aadhar linking and gave examples of stopping of malpractices in LPG distributions, Neem coated urea distributions to farmers thereby savings checking of syphoning of funds. He also cited the example of 4.5 lakh fake registrations in Mid Day Meal schemes in Jharkhand and Andhra Pradesh after the scheme was linked with Aadhar. He said so far 112 crore Aadhar cards have been made which is a glaring proof of our nation’s changing and marching ahead. The Minister also suggested for having more than 4-5 agencies for issuing rankings of higher education institutes as it will give more credibility. The Minister informed that in the forthcoming meeting of IIT Council on 28th April this month we will see whether IITs can also have a say in granting accreditation to institutions. 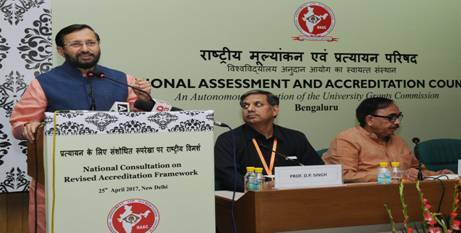 Shri Javadekar said “If we want to reach institutions in a time bound manner and assess them properly we need more valuators and therefore we want to build at least 3-4 more institutes and we should also give a message to institutions in this regard”. He further said that the commitment of Modi Government towards quality of education is unmatched and final as only the quality improvement will lead the nation in marching ahead. He said research and innovations are possible only there we respect the talent. He said the new ranking assessment system being chartered today is very important. The Minister urged the participants to complete this process in next three months preferably before next Independence Day. Today’s meeting was also addressed by MoS HRD Shri Mahendra Nath Pandey and Secretary Higher Education Shri K.K.Sharma. The National Consultation is being organized to discuss the revised Accreditation Framework developed recently by the NAAC. The foci of the revised framework are augmented use of technology, greater objectivity, and transparency of the process. Working groups of experts have deliberated and developed the formats for universities, autonomous colleges and affiliated colleges. The outcome of pilot study to validate the framework and feedback by stakeholders will also be considered in National Consultation. Approximately 100 experts comprising of eminent educationists, current and former Vice Chancellors / Directors, Statutory Bodies, Academics, Principals of Colleges will participate in the National Consultation. The inputs of the National Consultation would be used to fine-tune and finalise the revised Accreditation Framework which is slated to be launched from July 2017.